We cannot deal with bees in roof spaces, walls, under sheds, in compost bins etc. Generally these are wild bumble bees and can be left undisturbed if at all possible. If they are causing a problem, it is best to contact a specialist in pest control. A swarm of honey bees on a fence. If you have a swarm of honey bees, they will be unmistakable. There will be thousands of bees in a ball around the size of a football. Often these will be found hanging from a tree, bush or fence post. A list of members who have said they may be able to collect a swarm can be found below. Our collectors cannot get all swarms as their location and accessability are important factors. Before calling or contacting us, please check there are thousands of bees, as we receive many false alarms. Have some information ready, for example where the swarm is located, is it in a tree high up or another location that will be difficult to access? How long has the swarm been there and how large is the swarm? We cannot deal with bees in walls, sheds, roof spaces or compost heaps. Please read all of the information above before calling a swarm collector. They cannot deal with bees in roof spaces, walls or compost bins etc. 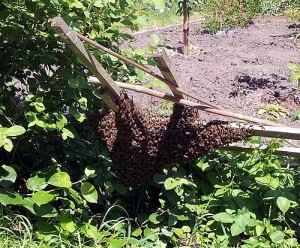 These are usually not a swarm of honey bees. They are usually wild bumblebees (see bottom of the page).